 Let's start at the beginning, our beginning. On the right are Mum and Dad Stock, Ian's parents, in their back garden in Marlow, around 1979. There's another of the two of them here, around 1976. None of our children knew Dad, who passed away at the age of 58 in 1983, and only the older children knew Mum all too briefly. She passed away at the age of 69 in 1996. 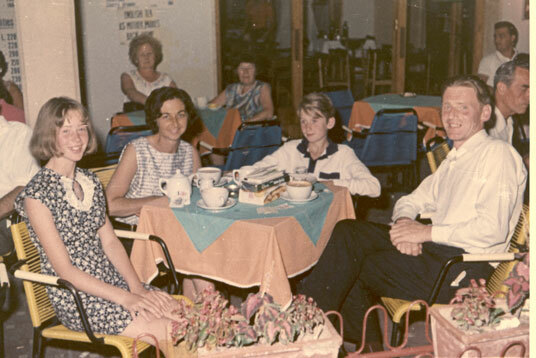 Below are Mum and Dad Stock, Sue and Ian during their first Italian vacation near Venice, July 1967. Mum had always wanted to visit Venice with us, and return to Venice Lido where she had been billeted during the war. Not a bad posting, you may note! Sue became Sue Nash in 1975 when she married Derek. There are shots of the Nashes below, and at Antony and Courtney's wedding. Summer holidays were a big deal for the Stocks. Dad was careful with his money, as befitted someone raised in wartime and in post-war England, but summer holidays and Christmas were times to let that caution slide just a little. 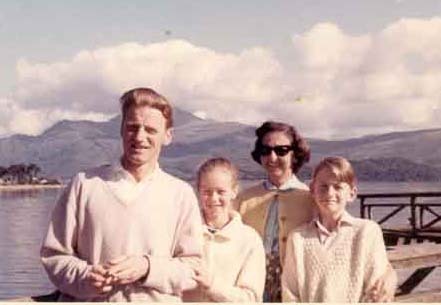 The summer of 1966, we took the sleeper train up to Scotland. Behind us in the photo below is Loch Lomond. Another dream vacation. We walked up Ben Nevis, the highest mountain in the UK, or at least Sue and Ian walked up it while mum and dad waited on a blanket about half way up. We saw the Isle of Skye for the first time, and all the beauty of Northern Scotland, and the sun shone almost all the time. If you knew the UK climate, you'd know how special that sun was. 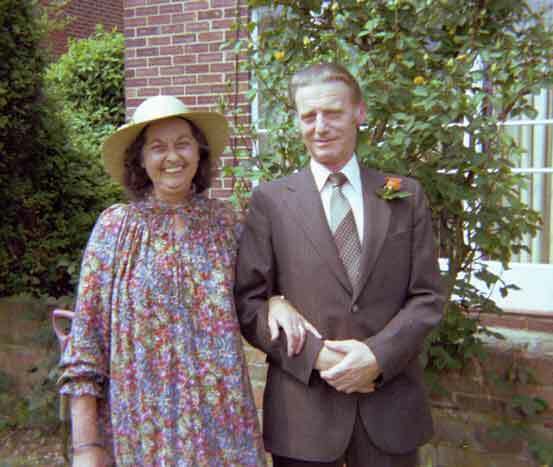 Cath and Jim Stock were married for over 34 years, until dad left us in 1983. Sue and Derek Nash celebrated 33 years of marriage in 2008, to each other! There's a reassuring consistency about both families. 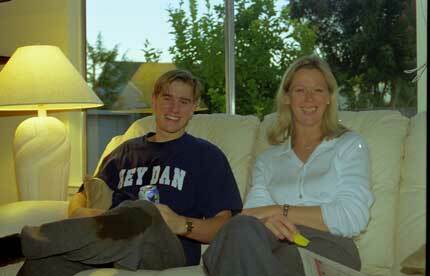 On the left, here we are at a pub near Marlow in August 1996. It was not long after mum's funeral. We have enough Irish in the blood (Grandma was 100% Irish) to feel both sides of a wake. Antony, below with his mum at home in Foster City, must have taken the photo. 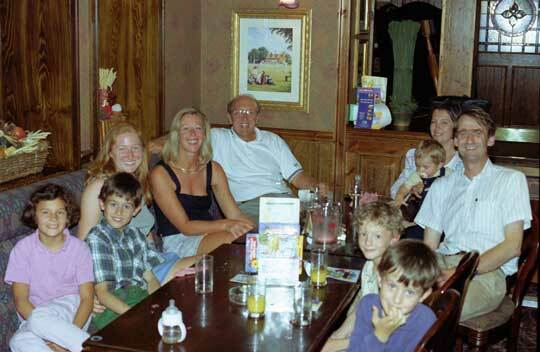 All seven of us (Alex was not yet born) are in the photo, with Laura, Sue and Derek Nash. 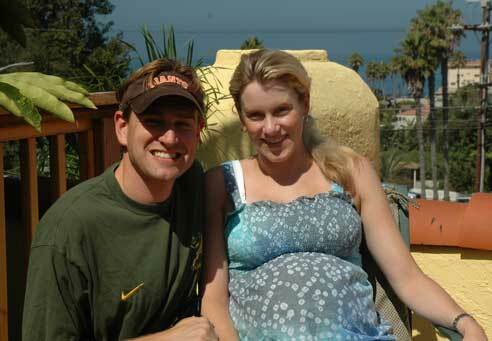 The Nashes lived in Foster City California for 12 or 13 years, until Antony moved to San Diego to take a great job. Sue and Derek promptly moved about a mile away from him! But they've moved on since, and are now back in Marlow. And below left is one of the Nashes in Paris. 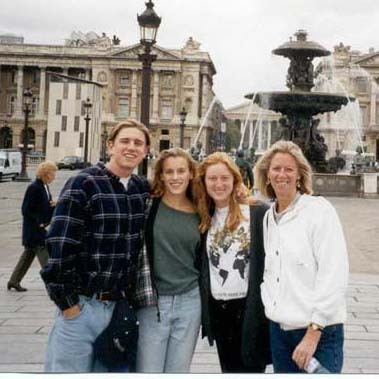 Derek must have taken this one of his family, including Courtney who dated Antony for years before marrying him in 2003, on Place de la Concorde in Paris in late 1994. Marie-Hélène, Ian, Charlie and Alex visited Antony and Courtney in San Diego for Charlie's birthday in 2005. A bit of a rough year, 2005, but you can see the good news in the below picture of the newlyweds (relatively!) on the roof of their home! 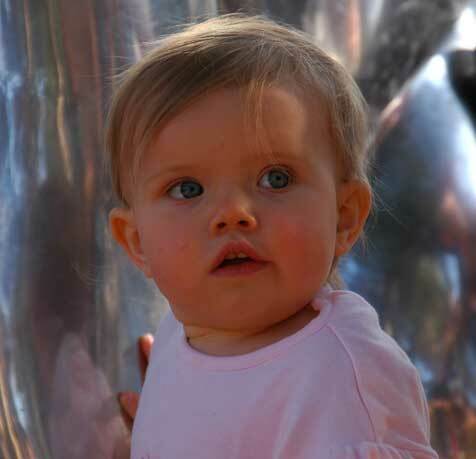 And sure enough, in October 2005, along came Avalon, who is the first Stock and Nash grandchild, and who would have been the first great-grandchild if her great-grandparents had survived, and who is in any event seriously cute. Here she is, at San Diego Zoo in March 2007. The circle turns.